Hello lovely! I've been so busy lately that I don't get a chance to date my blog! 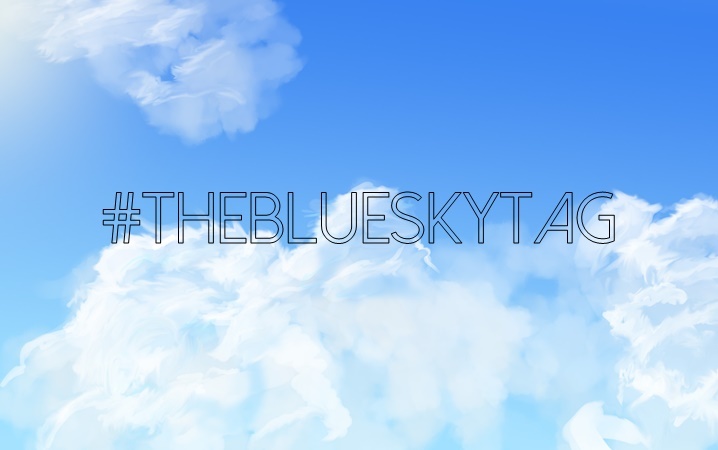 It's been few days since my last post and that I decided to do the Blue Sky Tag post. I've been nominated by three persons (I'm sorry if I missed out the person who tagged me in their post) which mean there are 33 questions I have to answer. So, are you ready? Here we go! A. Cooking it is! It's much easier as you can simply make something good and yummy without needing to measure a number of ingredients like when you do the baking. Just throw anything you think suitable for the dish in the pot and voila, you're done. A. Yes. Just like my answer in question number 1, cooking is easier and fun. A. Since I work with my parents at the food shop, I have to wake up around 430AM to get ready for work. I have to follow my dad and sekaligus sending my brothers to school which we usually will be out of the home around 540AM. Super early, is it? A. Young Adult, Romance and Fantasy. A. One of the latest books I've purchased is Another Country by Anjali Joseph. I've read few pages and yeah, I don't really like the writing style. It's kinda boring for me. A. Nope. Never. Well, I wish I had experienced this at least once in a lifetime! A. I never had any pets. I wish I could pet a cat but sadly my dad won't allow a cat in the house. Sobs. 10. If you been given a chance to travel into a new dimension, would you take that chance? A. Well, I'm not sure. How would life be in that new dimension? 11. What would like to tell your another version from another dimension? A. It was when the customer, especially a guy come to the shop and ask me what to eat. Sambil dia fikir sambil tu lah dia tenung mata saya as if dalam mata saya ada menu menarik! Kita pun jadi shy shy cat bila dalam situasi tu hahah! A. The best I have ever bought for myself is my sempua gold ring and the worst is fonemax x-pro nylon cable for my iPhone that cost RM89 but unfortunately, I can't use them as it's not certified. What make it worst is I can't even get my refund since I bought it in KL and I already went back to Sarawak when it happened. Rugi! A. I guess I will just take a pseudonym and stick to my name. A. Me, myself and I! A. Makan dan tido. Hahaha! 7. Who is the fourth person on your missed call list? A. My boyfriend, Sengaja tak jawab sebab merajuk hahaha! A, Sorry, Amer. It's not Suri Hati Mr Pilot for me. :P It's been awhile I didn't watch TV tbh. But I used to love CSI! A. Ohhh shooot migraine is in the house! A. Care about what people think or say about me. I will just live my life the way I want to. A. Yes! Okay just kidding. It's fun to answer these questions! A. Matte Fever Lip Color Balm by Silky Girl in Scandal and Classy shades. A. No. It's enough as long as my friends come on my wedding day to meriahkan suasana. Plus I don't really like to follow the trending thingy. A. White, purple and peach. A. Being in the middle of another city. A, Because I love writing and I love having my own platform to write walaupun constantly have writer's block. Plus blogging is a big community and it's fun to know people that share the same interest with me! A. Yes! I like your blog because it has the minimal and clean look! Nak singgah pun senang hati hihihi!